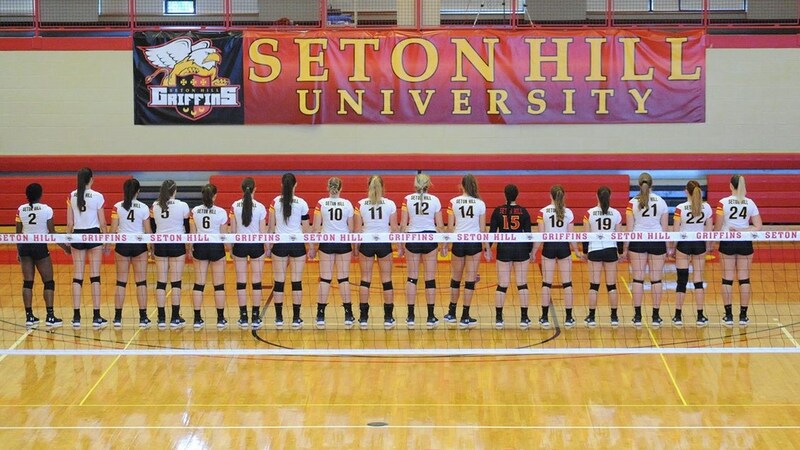 The Seton Hill University volleyball team poses for a photon Mckenna gym. From left to right; Umari Stroud, Rachel Satira, Teresa Weickert, Cameron Baril, Jillian Livorse, Terese Mihalcin, Sidney Chapman, Viktoria Farian, Lauren Nelson, Jessica Hanson, Hannah Moeller, Danielle Nese, Veronica Johns, Leah Bisignani, Erin Parks and Taylor Sabol. Photo from SHU Athletics. 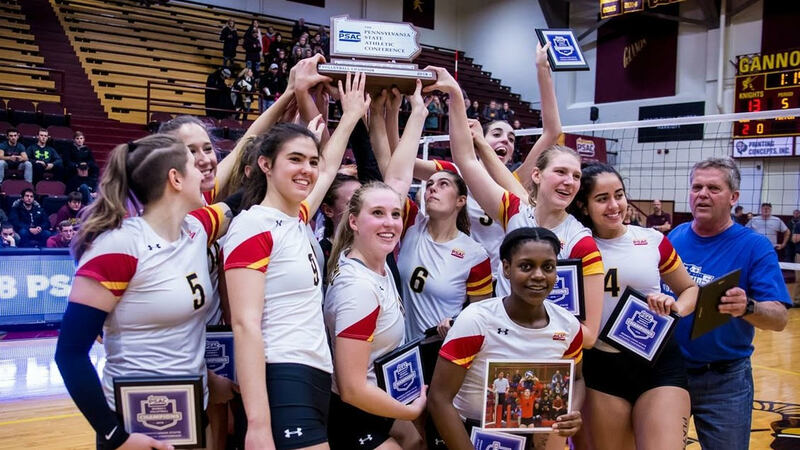 From honoring past teammates to succeeding on the court, the Seton Hill volleyball team is winning in the game of life. 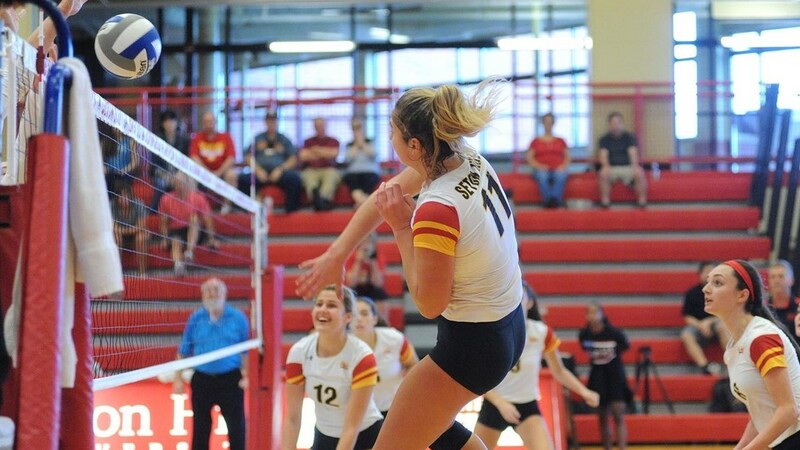 The Griffins beat California University of Pennsylvania in the quarterfinals and Gannon University in the semifinals, advancing all the way to the championship before losing to Wheeling Jesuit 2–3. “Even in our last game, we lost, but we played really well and fought really hard,” said junior setter Taylor Sabol. The Griffin volleyball team hadn’t advanced to the conference semifinals since 2014. That year, the conference semifinals were actually hosted at SHU, but unfortunately, the volleyball team lost to Cal U 0–3 at the time. The Griffins raise their trophy high after winning the first ever PSAC Championship in Seton Hill History. Middle hitter Umari Stroud holds a photo of former teammate Maggie Murray, who passed away in September. Photo from SHU Atheltics. Coach Rick Hall describes this year’s team as a “close knit group,” from “the kids that start and the kids that come off the bench.” Sophomore outside hitter Viktoria Farian was even named the PSAC Athlete of the Year in both her freshman and sophomore year. Hall attributes this bond to the team’s recent success. “Of course, the passing of Maggie Murray has made us a lot closer also as a team,” he added. Murray, former volleyball captain and recent SHU graduate, passed away this September. Her loss deeply affected the members of the university. “For each game, we have blue warmup shirts that have her name and number on the back of them,” Fleury said. “And during the game, we have written on our left leg, ‘Play for Mags’ with the number four.” A blue bow with “M.M.” adorns each girl’s shoe, and pictures of Murray hang in the gym and locker room. In honor of her memory, St. Joseph’s chapel held a memorial service and the volleyball team had a whiteout game. The Honors Community created the #kindnessforMaggie project, where students were invited to come up with random acts of kindness they could do in Murray’s memory and either write it down to place in a box in the Honors Lounge or tag it online with #kindnessforMaggie. Outside hitter Viktoria Farian spikes the ball over the net, while teammate Lauren Nelson cheers her on. Photo from SHU Athletics. This is why, Hall said, he believes the team is working harder in her memory. “She’s helping us even though she’s not here on this earth,” he said. This is Hall’s 34th season coaching at SHU. He has led the Griffin volleyball team to over 700 victories. Throughout the years, Hall still loves the game and what it offers the students who play. “It’s a sport where if you don’t quit, you always have a chance,” he said. The Griffins’ perseverance led them far this season, and the teammates benefit in more than just winning games. “Making connections with your teammates and enjoying the people you work with or play with is really important,” Sabol said. “My goals for every team that I coach is to make sure that these girls get a great education, take a step in the right direction once they get out of here and learn that competition is a part of life,” Hall said.